(Parish-Watson Gallery, New York); sold to Harry G. Steele [1881-1942], Pasadena; his widow, Grace C. Steele [d. 1974]; gift 1972 to NGA. 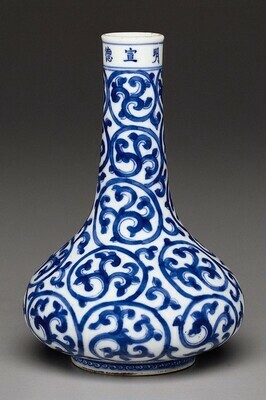 As in the stem bowl from the Ming dynasty, 1972.43.55, the underglaze cobalt oxide pigment has emerged to the glaze surface along the outlines of the decoration. The foot-ring is smoothly beveled, and the base is recessed and glazed. Bower, Virginia, Josephine Hadley Knapp, Stephen Little, and Robert Wilson Torchia. Decorative Arts, Part II: Far Eastern Ceramics and Paintings; Persian and Indian Rugs and Carpets. The Collections of the National Gallery of Art Systematic Catalogue. Washington, D.C., 1998: 248, color repro.